Q: Do you feel uneasy about current popularity? Q: I heard that you had heart disease during childhood, and learned acting in order to change the overly introverted personality. Q: Although began as such, but acting seems very suitable for you. Q: But acting should not be always so relaxed and happy, it’s not easy in the beginning? ▲ When Kim Soo Hyun laughed and asked to sign, he began to sing facing the camera. “OK? Still want? La la la.” Looking he played prank, photographer also smiled and pressed the shutter. Q: When did you overcome this difficulty? Q: How do you feel when shot Dream High and The Moon that Embraces the Sun? “Song Sam Dong in Dream High and Hwon in The Moon that Embraces the Sun have a lot of differences with me personally. I am not as simple as Sam Dong, and also does not have the impromptu personality. Through Sam Dong, I learned of the way of speaking outright, concealing nothing in heart. Hwon is stronger and smarter than me, good at politics. In order to play this role well, I seriously studied the manga Beyond the Heavens that depicts Cao Cao delicately. Before shooting, I have carefully thought of what kind of manners I should use. Q: Which scene you are most satisfied with in The Moon that Embraces the Sun? Q: Heard that you are an amusement on the set. Q: Just counting CFs, you’ve shot 15. If the exposure is too high, it may not be a good thing for actor. 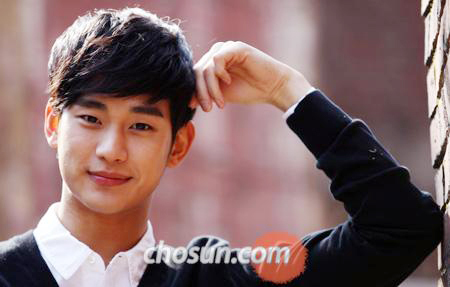 Q: Put aside the status of actor, ‘youth Kim Soo Hyun’ is what kind of person?